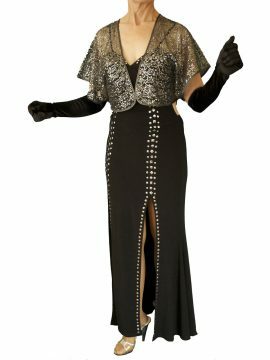 A elegant fine quality sequin shrug for evening wear, perfect for that special occasion outfit. It is made with sequins sewn in an intricate pattern on to fine lightweight net fabric. This is edged with a narrow strip of fabric that matches the colour of the sequins. The shrug is a short length, being above-waist level, and has open sleeves with no fastenings. One size (but will not suit Plus/XL sizes.) Made by Dents, crafting the world's finest gloves and accessories since 1777. Available in black or pewter silver. Please see our Product Description below for full details. (RRP £89.99). A lovely knitted poncho set with matching beret and gloves in soft knitted yarn for everyday or smart-casual outdoor wear. And, of course, you can wear each piece as separate items. The poncho is made from a square but forms a V shape at front and centre back when worn. Each piece in the set has a matching rosette. 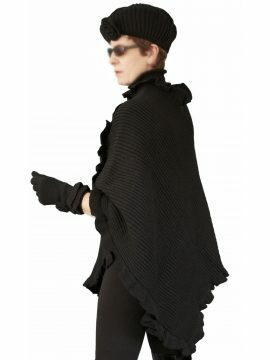 The knitted poncho and cuff of the gloves also have a frilled edge. All pieces are 'One Size'. Made by Pia Rossini, a leading UK brand for fine accessories. Available in black, navy or claret (deep red). Please see our Product Description below for full details. 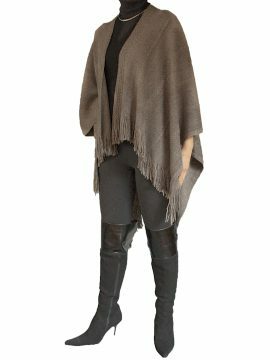 Lovely Pia Rossini wrap shawl knitted in gorgeously soft yarn in mink brown with fine interwoven silver lurex thread and finished with fringed edges. One size. Perfect for smart-casual wear, day or evening, anywhere to wrap around you to keep warm and cosy. One size. By Pia Rossini, a leading UK brand in fine accessories. Please see our Product Description below for full details.